So, according to Wikipedia a unit can be "an entire module", "an individual function", "an entire interface/class", but also "an individual method". A little less vague, a unit here is described as the "smallest piece of testable software in the application". This still leaves room for debate. ...Firstly there is a notion that unit tests are low-level, focusing on a small part of the software system. Secondly unit tests are usually written these days by the programmers themselves using their regular tools - the only difference being the use of some sort of unit testing framework. Thirdly unit tests are expected to be significantly faster than other kinds of tests. A unit test is an automated piece of code that invokes the unit of work being tested, and then checks some assumptions about a single end result of that unit. A unit test is almost always written using a unit testing framework. It can be written easily and runs quickly. It's trustworthy, readable, and maintainable. It's consistent in its results as long as production code hasn't changed. I really like this definition, however, I find the choice of using the term "unit of work" unnecessary, especially because it is a loaded term. For example, when discussing Object Relations Mappers (ORMs) the term "unit of work" has a completely different (and well established) meaning that is misleading in this context. Can we agree that when we are writing a unit test we call a single method on the class we are testing? If so, then why can't we consider a unit to be the logical path (path that the execution of the code takes) through that method given our initial setup of the test. Let me show you an example using an Account class and a Withdraw method. If there are enough funds, the amount withdrawn is taken from the account's balance, if not an InsuficientFundsException is thrown. There are two possible logical paths through the Withdraw method, one where there are sufficient funds, and another were there aren't. If we want to be thorough, we should write a test for each. Let's have a look at how this definition works while we write the Deposit method for our account. And let's do it test first. We can see that up until now we have a test per logic path. We can add an extra test to cover the case where the amount is zero. However, I'd argue that that test exercises the same logical path through the code (unit) than the positive amount test (however, no harm will come in having that extra test). If we want the method to behave differently when the amount is zero, then we'd have to add another if statement, and that would produce another possible logical path through the method, for which we could write another unit test. You've probably noticed that I added a few dependencies (IFraudDetectionService and INotificationService). We'll get to that. But first, what happens to the tests we previously had? If we look at all the possible logical paths through the Deposit method we can see that the there's no way that that test fails in isolation (path 2). If the balance is not updated correctly, both Deposit_SuspiciousAmount_UpdatesBalanceAndSendsEmailToFraudDeparment and Deposit_NonSuspiciousAmount_UpdatesBalanceAndDoesNotSendsEmailToFraudDeparment fail. If we want that our definition of unit takes this into account, we can say that a unit is a verifiable change that occurs in a logical path through a method. That can be a change of internal state that is externally visible (e.g. 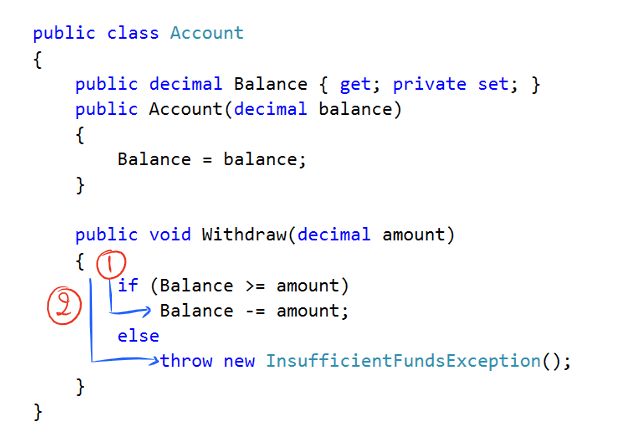 the Account's Balance), a method invocation in a dependency (e.g. verify that the notification service was called) or the return value of the method. One thing you might have noticed is that this idea of logical path is very similar to a measure of software metric named Cyclomatic Complexity. A method's cyclomatic complexity is "the number of linearly independent paths through the code". In fact, right now, as I read the Wikipedia entry, I've just noticed that author the Cyclomatic complexity metric (Thomas McCabe) had this exact same idea (one test per logical path) as a testing strategy in 1996 (way before unit testing was popular). It is named basis path testing. This is a bit of an aside, but you should have noticed that I used interfaces so that I did not have to specify a specific criteria for when a deposit is considered suspicious, or how the "fraud department" is notified. I brought this up just to mention that if you write the tests first you'll have these problems in mind, you'll want to write your code so that it is easy to test. You will feel compelled to write small focused methods, and be very mindful to what does and doesn't belong in a class and should be considered a dependency. 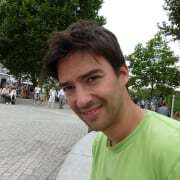 Say the implementation of that dependency made a call to a database or some other service over the network. That would make that test be considered an integration test. However, I'd argue that even if no database call was made, or any service called, you should still use the isolation framework and create the stub. It removes uncertainty. When the test fails and you are in full control of what was executed, you don't have to guess what went wrong. Your last point is interesting: people write integration tests when they encounter code that has side effects and they want to have the side effects tested. Another common strategy is to use mocks (preferably generated ones) via e.g. 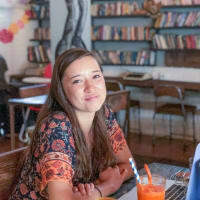 Mockito in Java. This is a great way to test code paths where the side effect is the most interesting thing that happens in a unit tests without making it an integration test. Unfortunately, lots of developers don't appreciate the futility of doing code coverage tests with integration tests. The whole point of a unit test is that the units are small and there is a small and finite number of paths to test so you can achieve a high degree of test coverage with little effort. This is not true for an integration test. The more stuff you gobble together the more code paths you have and it quickly explodes beyond the threshold of having reasonable coverage. It is for that reason that I prefer to write either an end to end, blackbox integration test that is about testing realistic user scenarios against something that closely resembles the shipped product configuration, or a pure unit test that is about covering all relevant code paths. Anything in between neither achieves the goals of coverage nor of realism and tends to be a waste of time and resources. If you are mocking half your system and then running some in memory database, your tests are not very realistic and your code coverage is likely to be poor. So, why would you do that exactly? My personal experience is that this kind of tests become more of a burden than benefit in a long run. I should know, I've written thousands of tests like in this post. The number one reason why I want tests is safety when refactoring the solution. However, tests with too small unit don't support this. It' rare that refactoring happens in such a limited scope and therefore tests need to be modified simultaniously with production code, which scares me. Nowadays I write unit tests with larger scope and I recommend giving it a try! I think unit tests are not always appropriate. 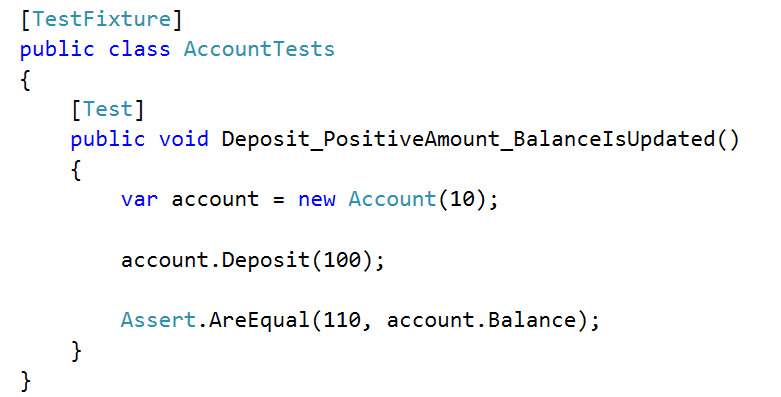 If you're trying to test code which is largely business logic I'd go with unit testing, for example. If you're trying to test code which is very network intensive I would do integration testing or something along those lines instead. You end up doing so much mocking in those situations that it becomes apparent that you're making a lot of assumptions (i.e., the benefit is negligible). Pick the right tool for the job I suppose. To keep it simple to explain I tend to say that unit tests should be the smallest piece of code possible (like a function) and should not do any IO. To me these are the most important aspects of unit testing.